With shows like Flip or Flop and Fixer Upper being hugely popular, we have found more and more homeowners are ready to do their own renovations. Often, we get inquires from homeowners asking if they should just do it themselves or how to do something. Each inquiry is different, but our advice is the same, for your own safety when it comes to asbestos containing materials, no. Asbestos removal is a costly process and we understand the desire to want to save money on a project or put it into different aspects of the renovation. We've heard some horror stories from folks to hired people off craigslist for popcorn ceiling removal or the husband who watched a youtube video. The truth of the matter is that, if asbestos is not properly contained and removed, you can contaminate your home and put your family at risk of health issues but long term and short. 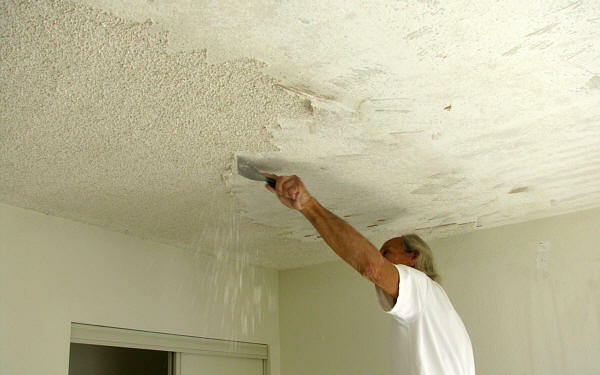 Popcorn ceilings are a eyesore and often when buying a new home or renovating those are the first to go! While not 100% of popcorn ceilings or acoustic ceilings contain asbestos, many do. We recommend you get these tested before begin to modify your ceilings. There are many testing companies who will come to your home and safely collect samples and give you results in about 24 hours. This will let you know if it is safe to proceed on your own or if an abatement company like us, CVE, is needed to come in and safely remove and dispose of the materials. Several months ago, we had a woman call in panic because a company without proper training and licensing came to remove her popcorn ceilings and her neighbor called the EPA about debris all over the sidewalk and lawn. As it turned out, it was positive for asbestos and she was fined for the contamination and her whole home was marked as a health hazard, all her soft materials had to be thrown out, including mattresses and couches, her air vents and whole home needed to be professionally cleaned by an abatement company. Her total was going to be out tens of thousands of dollars because she was trying to find a cheap solution to the problem. Even her grass had to be vacuumed to pick up particles. Most licensed abatement contractors shy away from even the clean up on project like this due to the liability they would take on. Upgrading dated vinyl flooring or yucky old carpet can often uncover more asbestos containing materials such as vinyl floor tiles or sticky mastic. These materials were quite popular and affordable to install in homes during the 50's-70's. This is another area of home improvement we recommend you get tested by a professional before you disturb the materials. Ripping up old carpet is easy enough if you watch a video, but if there is asbestos containing mastic under it, you could be making it airborne by ripping it up. If you inhale this or particles get in your eyes, you can be in great discomfort as they are near impossible to remove from your lungs and will cause heavy irritation to your eyes. Additionally, most flooring installment professionals require a test showing all the hazards are clear in order to make sure OSHA rules are followed to protect their team. If your test originally came back negative for asbestos, then you are good to go all your own! We just want to make sure you and your family are educated about the dangers you are risking. CVE is certified to safely remove any materials that come back positive for asbestos and then you can install the new flooring on your own once its cleared of hazards. CVE offers free estimates for projects. If you are thinking of beginning a project at home, please give us a call to come walk your property and help educate you on any potential hazards before you proceed. We offer a no cost quote for you and leave the decision in your hands. Please call or email your local CVE office today!